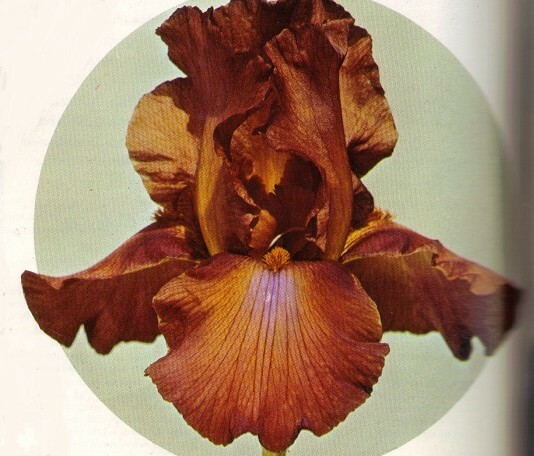 From Schreiner’s Iris Lovers Catalog 1974 (intro year): “One of the most colorful varieties, this iris is a remarkable combination of ever changing hues, a veritable polychrome of russets and deeper bronze shades reflect the color of this shapely, flaring beauty. A feathering of soft blue eaves a delightful pattern in the center eye-zone of the falls and seems to vary with each glance. Petal structure is extremely solid, contributing to the lasting quality of this remarkable flower. It is free growing, with ideally branched stems with 7 to 8 buds. 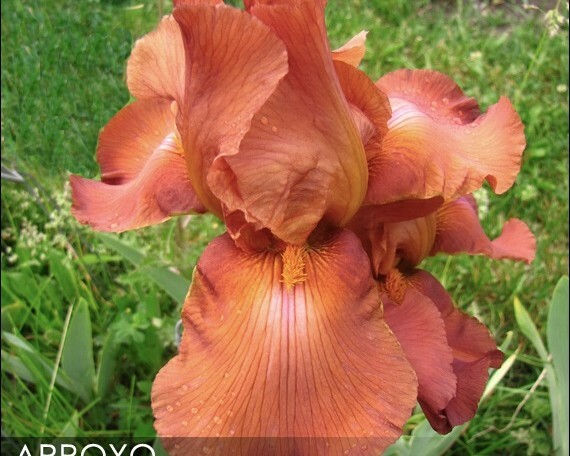 The beard is a subdued bronzy gold.” (( ‘Olympic Torch‘ x T 299-2) x ( ‘Trim’ x ‘Bronze Bell‘)) X W 552-A: ( ‘Gingersnap‘ x ‘Sutter’s Falls‘).